Volume is the three-dimensional spatial characteristic of an object or container. 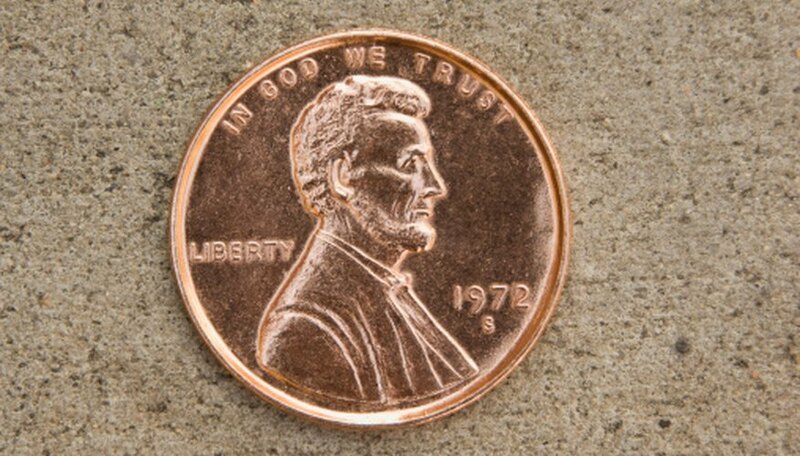 You can calculate the volume of a penny in one of two ways. The first way is to treat a penny like a small cylinder and calculate the volume based on its linear measurements -- that is, multiply the radius by itself, take that number and multiply it by pi and, finally, multiply the result by the penny's estimated thickness. This method is not precise, however, because there are raised portions on the surface of the penny that are difficult to measure. The more accurate method is volumetric displacement. Clean the penny with hot soapy water, rinse well and dry with the towel. Fill the graduated cylinder with 10 milliliters of water. The bottom of the meniscus -- the concave curve of the water in the cylinder -- is the point of measure. Place the penny in the cylinder and let it fall to the bottom. Read the bottom of the meniscus again and record the second volume in milliliters. Care should be taken to read this value. Subtract the first value, 10 milliliters, from the second volume reading. For example, if you measured 10.3 milliliters, you would subtract 10 from that volume to calculate 0.3 milliliters. Multiply the volume difference calculated in the previous step by 0.061 to express the volume in cubic inches. If the volume difference is too difficult to read accurately, clean four more pennies, dry them thoroughly and drop all five pennies in the cylinder. Take the difference in volume and divide by five to get the volume of a single penny. Baer, Brian. "How to Find the Volume of a Penny." Sciencing, https://sciencing.com/volume-penny-8159012.html. 24 April 2017.